Pulled pork can be used in different ways to create an easy and tasty meal each time. We started with a 3 pound pork shoulder (that’s a lot) and cooked it in a crock pot using this flavorful Easy Southwest Pulled Pork Recipe. We ended up with enough to use over the next couple of days and came up with these easy pulled pork dinner ideas to keep each bite exciting. What you need: pulled pork, pickles, mayo, yellow mustard, bread (white bread or white roll), ham (optional). Mix mayo and mustard together. Build sandwich bottom to top as follows: bottom bread, mayo/mustard mix, pickles, ham (optional), pulled pork, mayo/mustard, top bread. What you need: pulled pork, lime, tortillas, taco toppings such as: chopped yellow onion, chopped tomatoes, salsa, sour cream or crema, cheese, pickled jalapenos, etc. Squeeze lime juice and some of the liquid from the pickled jalapenos on the pork. Let sit for a few minutes. Warm up the meat and tortillas and build your tacos! 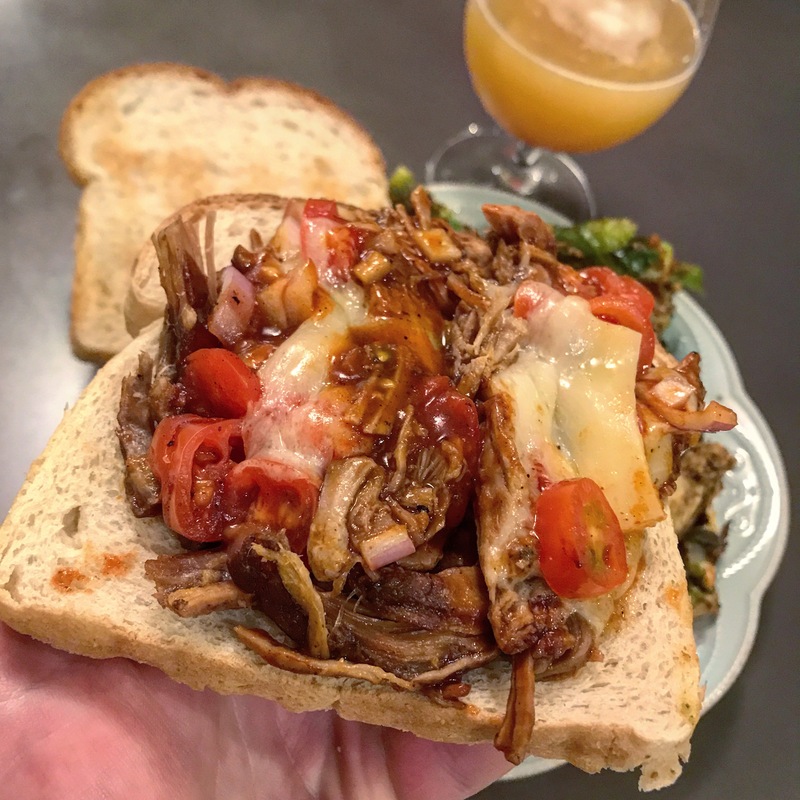 What you need: pulled pork, BBQ sauce, white bread or buns, white cheddar cheese, other toppings you enjoy such as sliced onions, tomatoes, etc. Add sauce to pulled pork and top with cheddar cheese. Heat up the pork and just like that you have a tasty BBQ pulled pork sandwich. What you need: pulled pork, lettuce of your choice (we like baby kale), extra virgin olive oil, lime juice, black beans, feta cheese, sliced yellow onion, chopped tomatoes, salsa verde, pickled jalapenos (sliced). Add all ingredients to a bowl and toss to incorporate. What you need: pulled pork, sandwich roll, lime juice, black beans (mashed), mexican cheese blend, sliced yellow onion, pickled jalapenos (sliced). Squeeze lime juice and some of the liquid from the pickled jalapenos on the pork. Let sit for a few minutes. Cut the sandwich bread in half and toast in the oven at 300 for 3-5 minutes until slightly browned. Mash the black beans into if you have whole black beans. Heat the meat and build the sandwich bottom to top as follows: bottom bread, mashed black beans, onions and pickled jalapenos, pork, cheese, top bread.